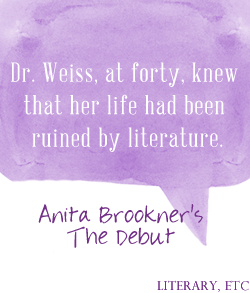 Today’s book is Anita Brookner’s The Debut and this one really intrigues me. Makes me want to flirt a little to see where things will go. It leaves me intrigued. Anita Brookner is like a card shark: she keeps her cards close to her chest, and plays them little by little. A great writer.